The first Quarter-Final match of the Copa America was played today. Chile beat Uruguay 1-0, but it wasn’t a simple victory, it was a controversial one. In the 62nd minute, Uruguay Star Edison Cavani was handed another yellow card and was sent off with a red. The first yellow he received was warranted, but the second one wasn’t. Cavani was provoked and then the Chilean player flopped. The referee handed Cavani the second yellow and Uruguay was down a man. 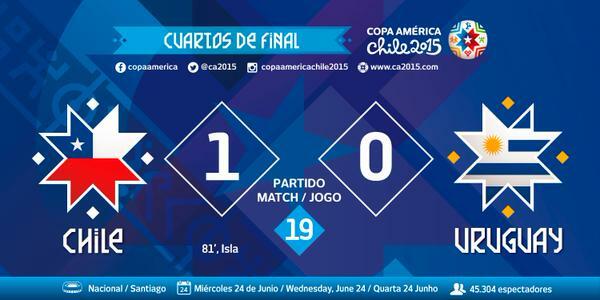 At the 81st minute, Chilean player Isla scored the eventual game winner. Uruguay had 9 minutes left in the game plus extra minutes at the 90 to score a goal to draw the game, but another terrible referee call would end their tournament. The Uruguay player Fucile cleanly challenged Alexis Sanchez, but the referee gave him a second yellow citing the tackle dirty. All in all, Cavani didn’t deserve the second yellow that he was given. The Chile player clearly provoked him and then flopped. Chile went on to score their game winner while Uruguay was down a man. Add to the fact Uruguay would be handed another sending off. Fucile clearly got the ball on the challenge and was sent off. Before all of this happened, the game was 0-0. These two horrible referee calls didn’t just help Chile get into the Semi-Finals, they extinguished Uruguay out of the tournament.